GNE is planning a trip to the Philippines March 23 through April 6, 2019, pending confirmation with our colleagues oversees. We will be traveling to 2 areas where we have new partners in Tacloban and Banaue. We will be working with local officials, health workers and community leaders to explore and develop new partnerships to improve health through nutrition. We will bring digital tablets with our general nutrition app to demonstrate and hopefully share with local women. We hope to have a modicum of micronutrient supplements to dispense. There will be one day each week for sightseeing. Tacloban is a small ocean-level city in the tropical (hot and humid) central island of Leyte reached by plane from Manila. Not too distant from the urban sprawl are lowland villages and tenant farmers. Our contact here is with pastors of the Church of Nazarene and their non-profit group, Community Outreach. 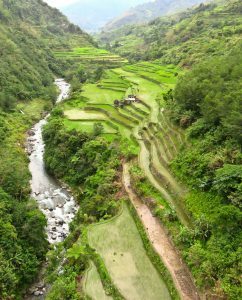 Banaue is in the mountainous province of Ifugao in the center of Luzon reached by vehicle +/- plane. Temperatures here are more moderate and mosquitoes rare. The nearby Batad rice terraces are a UNESCO World Heritage Site. There are many small villages and subsistence farmers. Our contacts here are with local physicians and community leaders who head a local non-profit, Mountaineer Outreach Banaue. We hope to work with the Rural Health District physician too. These areas are safe for travelers, albeit a lot of travel time. Travelers should take the usual medical precautions for travel and volunteers are encouraged to contact their physician or a travel specialist. We will go over common recommendations prior to departure. Travel insurance will also be discussed as there is always some element of discomfort and danger. Volunteers are expected to pay their own way via donation to GNE plus personal expenses. Price has not been set yet, but is expected to be about $3000. You will need a valid passport at least 6 months from expiration. Visa is not required. Tentatively we will depart from Portland on Saturday, March 23 arriving in Manila late Sunday and overnighting at the Nichols Airport Hotel. Persons making other flight plans can meet us there. Monday we will then fly on to our next destination, likely Tacloban where we will spend the next 3 days in team building and outreach activities and then have a day off. On Saturday, March 30 we will fly back to Manila and then on to Banaue Sunday. We will spend 3 days working and a day off for hiking and sightseeing. On Friday we will journey back to Manila for departure and return to US on Saturday April 6.